Thank you for being such an enjoyable forum, ASDF! Thanks to the people on it for being so nice and awesome! I am amazed. I can't post actively on multiple forum boards at the same time, and this is related to my concentration and my autism. I used to post actively on my second favorite forum, but I stopped posting on the other forum with exactly 846 forum posts before I returned to ASDF one week ago. And I will post on ASDF more. I am not saying in a public post which the other forum is, because I don't want to avdertise it on my favorite forum - ASDF. I like the other forum, so it took me more time to check it. But ASDF has some avdantages over it. -Formerly, the Games section of the other forum seemed really active, but I realized that actually, having in mind the activity of the interesting forum Games, the other forum did not provide for me a higher opportunity. The other forum has a whole bunch of active threads that would not be Games on ASDF, and on ASDF new Games always get a chance. 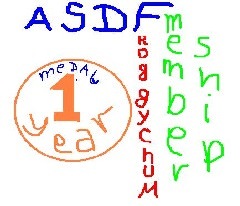 -The people on the other forum are good, undoubtedly, but the people on ASDF are even better. -In my point of view , the quality of the ASDF games, and on ASDF overall, is very high. That is why I will continue being grateful to ASDF and posting on it. Re: ASDF is an unbelievably nice forum! Thank you!